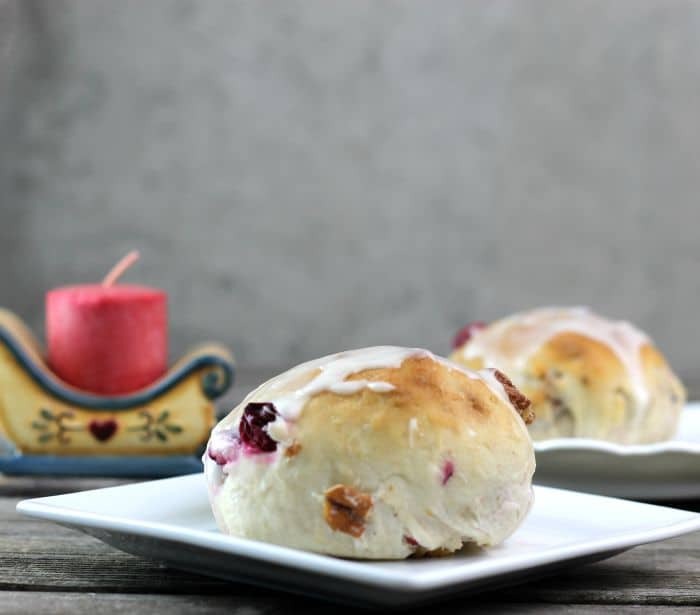 Cranberry orange pecan buns are made with yeast and are made into buns, easier than making sweet rolls. Yeast breads filled with nuts and fruit have always been a part of my Christmas celebrations ever since I was a kid. My mom made these breads only at Christmas time and they were always a welcome treat. 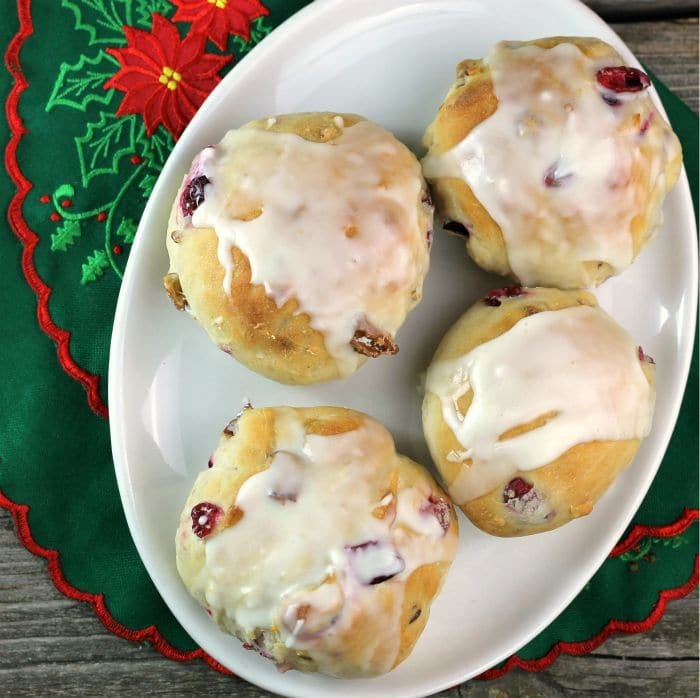 Although these cranberry orange pecan buns are not exactly like the bread that she made at Christmas time, they still remind of her delightful bread. 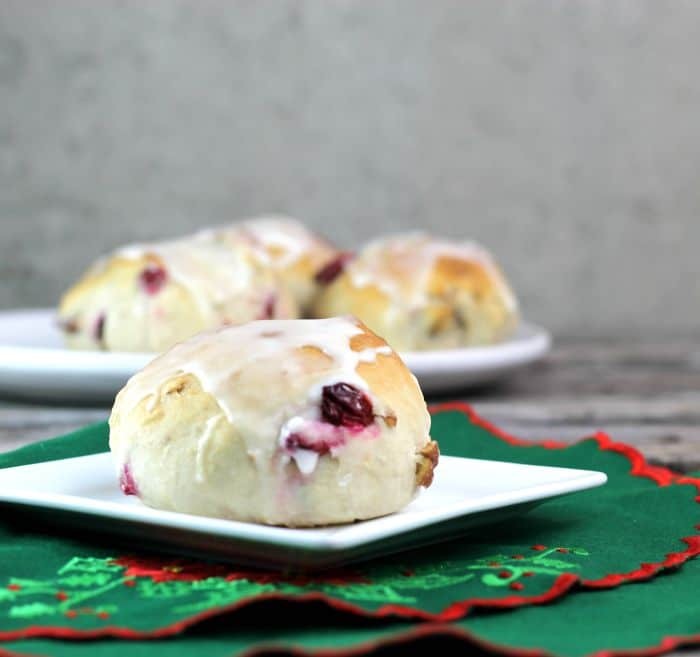 The cranberries give these buns a festive look and I love the tart flavor of the cranberries paired with the sweetness of the orange. The cranberry and orange combination is one of my favorites at this time of year. Just wondering if you are ready for Christmas? The days are counting down and Christmas is just around the corner. I am happy to say that things are coming together and I will ready for Christmas. Christmas day morning is always a busy time of day. The kids will all be coming home to spend the day with us. A lot of my family will be coming to help celebrate the day. And we have some friends coming also, so it will be a full house. 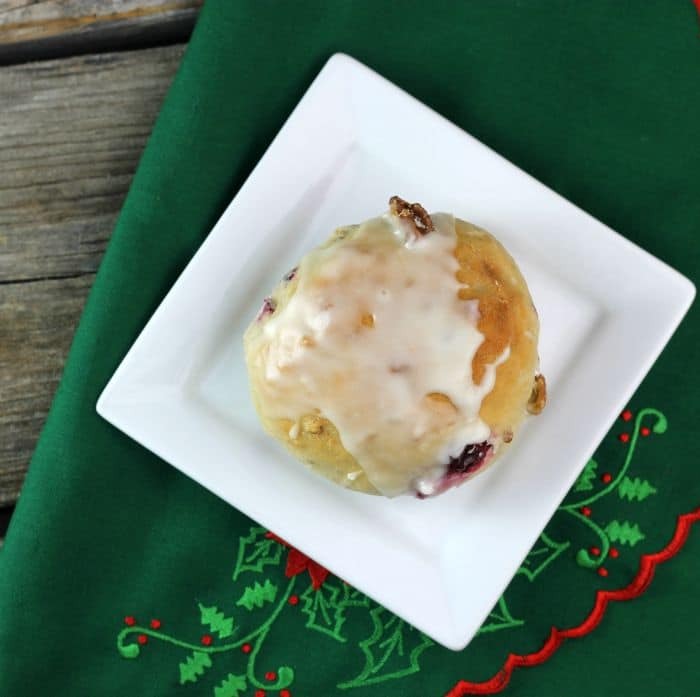 I know what I will be having for breakfast on Christmas morning… cranberry orange pecan buns. In a large bowl combine 2 cups of flour, yeast, granulated sugar, and salt. In a microwave-safe bowl or measuring cup add the milk, water, and butter. Heat until the mixture is 110 to 120 degree F. It is okay if the butter is not completely melted. Add the liquid to the flour mixture and stir with a wooden spoon until combined. Add the egg and mix in. Add another cup of flour and mix in using the wooden spoon. Mix in the chopped cranberries, pecans, and orange zest. Gradually add the remaining flour as you knead it in by hand. Continue to knead the dough until the flour is worked in and the dough is slightly sticky. Grease the bottom of the bowl with shortening and turn over to coat both sides. Cover the dough and set in a warm place. Let it rise for about 1 1/2 hours or until double in size. Divide the dough in half and then divide into 8 equal parts, so you will have 16 pieces of dough. Make the buns by fold the sides under the bun and pinching the bottom to make a smooth round bun. Place the buns on a greased baking pan about 2-inches apart. Cover and let rest for 1/2 hour. Preheat the oven to 375 degrees F while the buns are resting. Once the buns are ready to be baked place them in the preheated oven and bake for 14 to 16 minutes or until lightly browned. Remove from the oven and cool completely on cooling racks. While the buns are cooling make the icing. Add the 2 cups of powdered sugar to a small bowl add 4 to 5 tablespoons of the orange juice until you have the right consistency for drizzling. They look soft and wonderful with the combo of flavour, Dawn. Wish I had one of those with my tea this morning. Merry Christmas Dawn. My mom would make frosted yeast rolls at Easter, but I’d happily adopt these lovely buns for Christmas! Hope you had a wonderful celebration with your family, Dawn, and wishing you a very happy New Year!! Your cranberry buns look delicious, Dawn! Perfect with a cup of coffee. Sounds like you had a full house for Christmas! Here’s wishing you the best in 2018! They look and sound so delicious! Just the type of treat I love to eat on Christmas morning! Hope you had a wonderful Christmas! Happy New Year! Wishing you the best for 2018.